This new school year is sure to be an eventful one for my son. He's going into Grade 8! That means a big school trip, graduation festivities and, let's not forget, the need to build high school readiness. 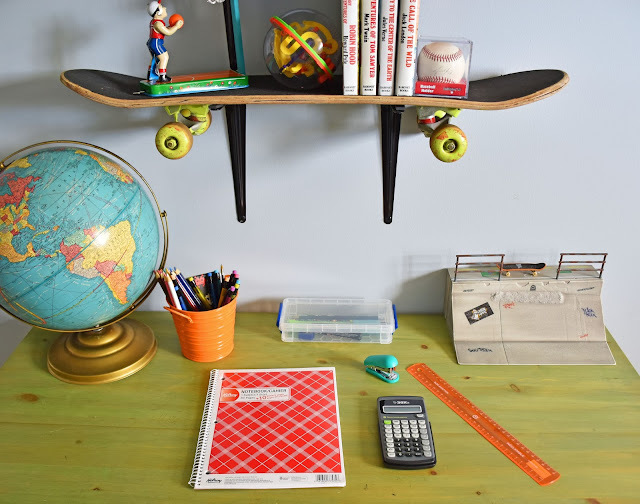 With just one year left until high school, my husband and I want to ensure that our growing guy works on his homework and study skills. 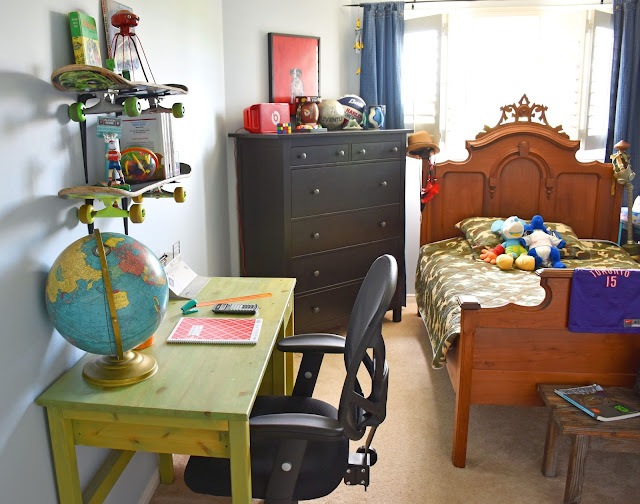 To that end, we spent some time recently creating a comfortable desk area in his bedroom. While he has often done homework in the kitchen in the past (with me nearby to help) I feel like it's time he has his own quiet space in which to work. We wanted his bedroom desk area to be a fun space with a bit of a vintage vibe. Because he has a number of skateboards in the garage, we figured he wouldn't miss a couple of them (ha ha). 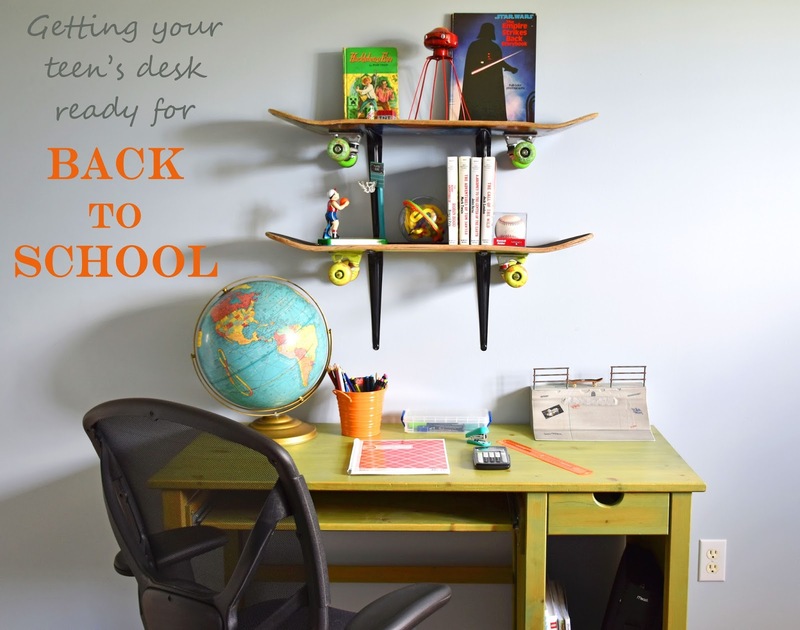 We created fun and funky shelving above his desk using two skateboards. (Actually we pulled one skateboard out of somebody's trash and the other one is an inexpensive skateboard that he rarely used.) We topped the skateboard shelves with a couple of vintage-style toys, some classic books like The Adventures of Tom Sawyer and a few of his favourite toys, like those little Minecraft guys that kind of hang around the house with nowhere to go. 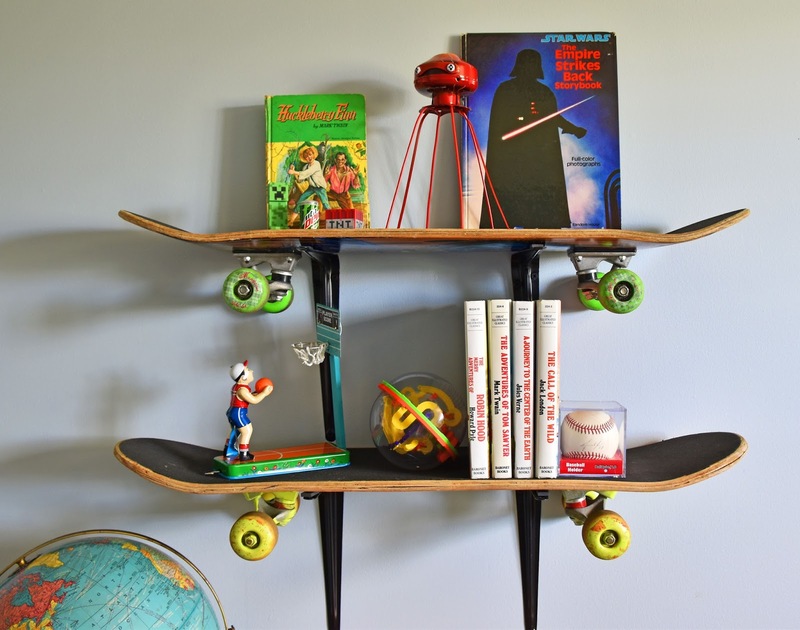 Turning your old skateboards into shelves could not be easier. We simply bought two shelving brackets per skateboard. We (and by "we" I mean my husband) then spaced the brackets so that one was just inside each of the skateboard trucks. We chose not to fasten the skateboards on in any way just in case our son decides to use them again. Obviously we also did not remove the wheels, although you could certainly make shelves using just the decks. (I actually like the look of the colourful skateboard wheels.) We put a small rubber stopper on each bracket to keep the skateboards from sliding. I think skateboard shelves make a fun look for a preteen or teen boy's bedroom. Sitting in his chair he can see the cool designs on the bottoms of the skateboards too. Because comfort is so important when you spend extended periods of time at a desk, we were thrilled that Staples provided us with this Staples Mesh Multifunction Task Chair in black. With features like a padded contour mesh seat, breathable screen back and adjustable tilt and height, it's going to be the perfect command central position from which to navigate Grade 8 homework challenges. A lot can happen in a child’s chair in one year. Ideas and inspiration flow, fridge-worthy art gets created and dreams for the future are envisioned. Staples wants you to share your story! Tell us in the comments what you or your child will do in your office chair this year. We'd love to hear your goals and dreams for the year. Look for more stories by following #BTSReady on social media. Aw thanks Desiree! So glad you like them! 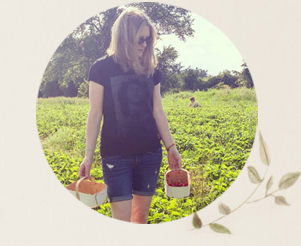 I want to learn more about growing vegetables too! :) And I hope he wants to learn more. Thanks so much! 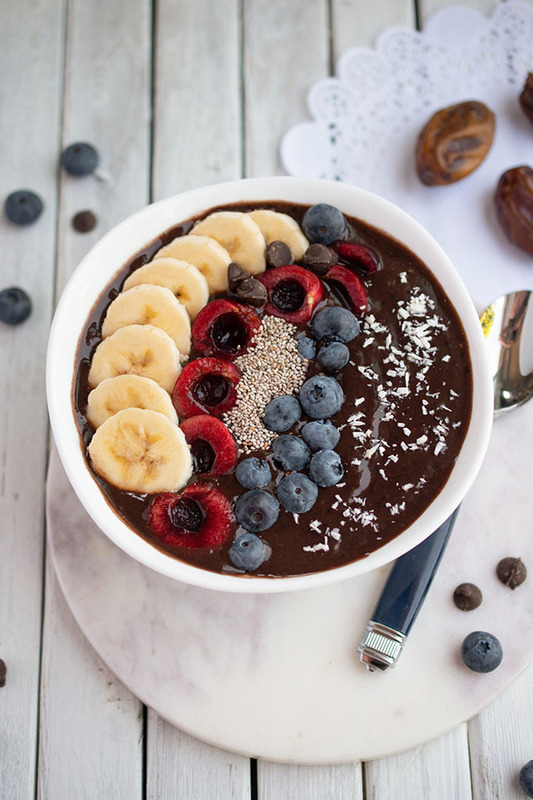 that looks really good-- love the vintage touches too! My son's room is currently a disaster area... need to clear it before a chair can even fit in there. Great shelves! I hope to get a lot of crafting done this year. Love the whole effect but especially the shelves. Very innovative!!! our challenge is keeping the desk organized and neat! Jo, the boys room looks great love the colour of the desk. Is it from ikea? I'm hoping to actually make some of my pinterest pins a reality this year so that's what I'll be doing in my desk chair. So many recipes, so little time! I hope to make my daughter's desk a place for inspiration! I would love to paint the desk cool colors. 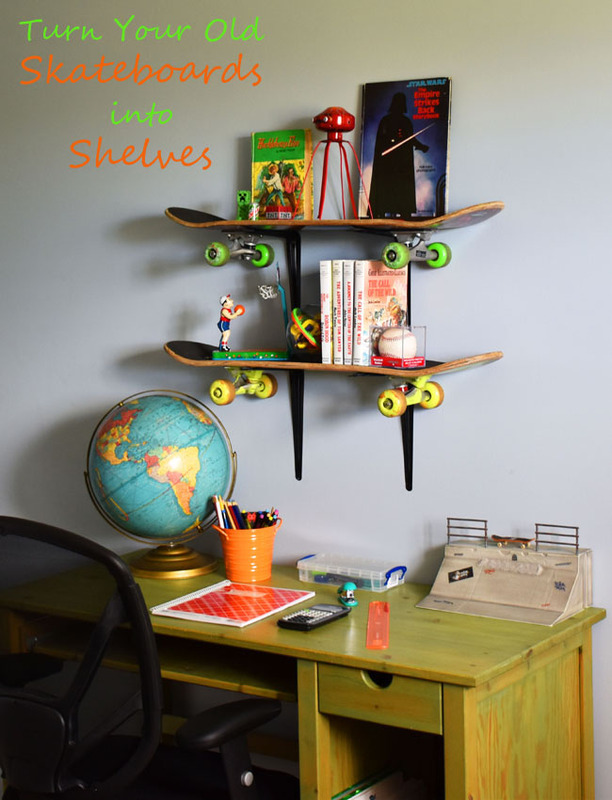 I love the skateboard shelves! We are redoing my sons room right now, time to get rid of the superhero red and blue walls. I am trying to set up a nice bright homework station for him. We bought a new desk, chair and a bright desk lamp. What a great setup! I love to help with my niece's homework. That looks like a great workstation! I wish my own office space was that inspirational! Love the desk! I hope my son learns his letters at his desk!